Looking for a great sandwich in Gastown? 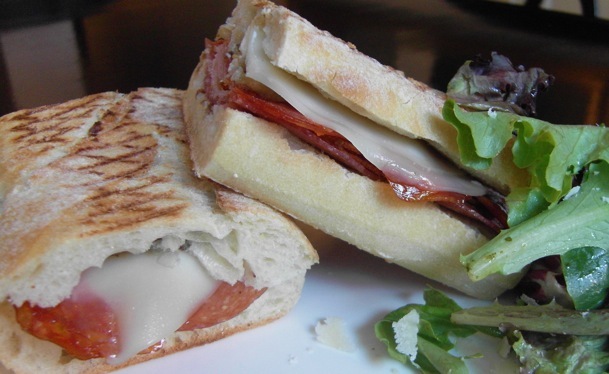 Notturno serves up delicious Italian paninis. That’s the motto I picked up on at Carrall street’s sultry new ‘modern panino bar’, which serves six modern Italian sandwiches you likely wouldn’t find in their boot-shaped country of origin. Consider them traditional panino’s hip, younger cousin, made with cool ingredients like grappa poached pear, tomato confit, and caramelized fig. Notturno uses La Grotta’s famous rustic Italian bread — the kind you tear at with your teeth. One side of my Calabrese was streaked with a sweet drizzle of balsamic, on which the meat and cheese — spicy capicollo, spicy sopressata, salami, provolone, and goat cheese — was layered. Adding even more kick to the hot creation were a few strips of spicy, pickled eggplant.The narrow space, with black glossy tables and a prominent bar, has all the features of a lounge. I wasn’t surprised to learn a liquor license is in the works, along with small plates, and extended hours.